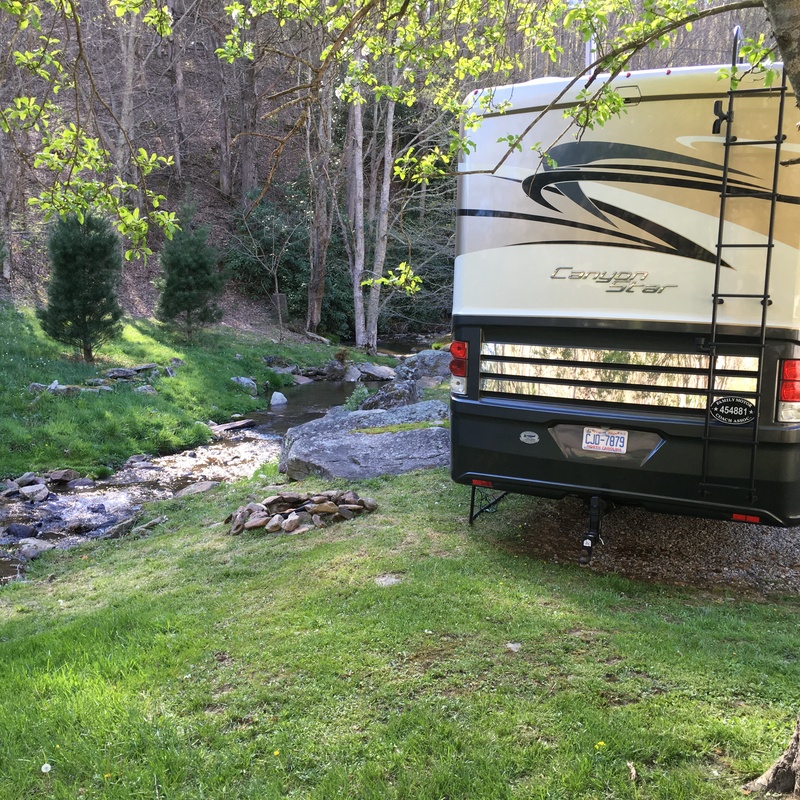 The Little Campground – Let's Go RVing! Generally we do the groundwork to leave the day before but due to the dance competition on Saturday we didn’t make any early preparations but it still didn’t take us long to get everything together this morning. We pulled out a little after 10 for a trip to Elk Park outside of Banner Elk, only a little over 100 miles. Our final destination was The Little Campground. Upon leaving we immediately had a GPS conflict so we went with the Garmin only to realize that we made a circular route and would have been better with the Clarion. Traveling on to Boone was uneventful and Jerry and I both listened to our audio books. I got a little cross stitching done. As we left Boone we had another GPS conflict so this time Jerry decided to go with the Clarion. Big mistake. 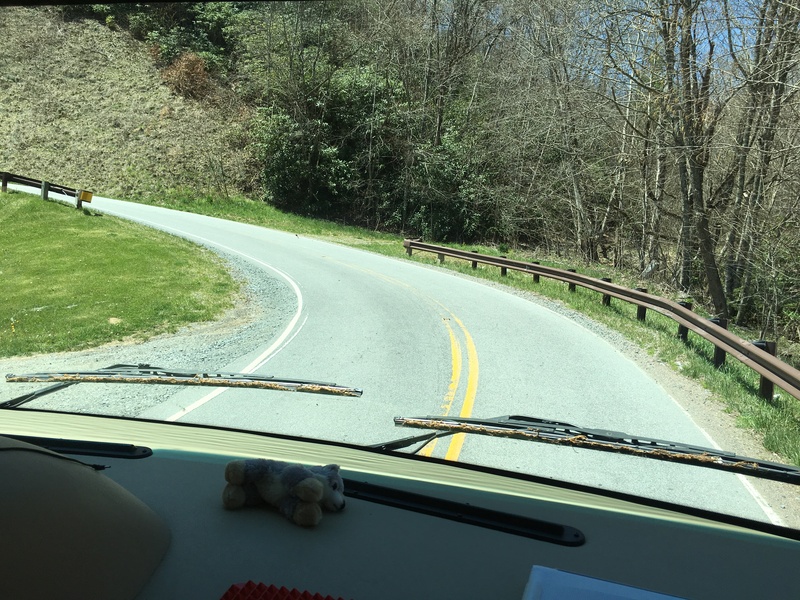 We ended up on Route 194 which led us through Ville Crues and then we were only 10 miles from our destination however the mountainous road we were on was what they write stories about. At one point we saw a big sign diverting trucks, saying they were not allowed. Are we considered a truck? Apparently Jerry didn’t think so and we trudged on. The picture doesn’t do it justice! Of course we had very little choice as there was absolutely nowhere to turn around. We soldiered on and to say that it was harrowing is a great understatement. At one point the speed limit increased to 35! Approaching the numerous hair pin curves was really nerve wrecking as we couldn’t see around to see if cars were approaching and they often were and not always slowly. We slowly counted down the 10 miles and eventually got to Banner Elk. From there to the turn off for the campground was relatively uneventful but when we reached the turn the GPS said to take a sharp left. No, it is not a sharp left – it is a u-turn with a no outlet sign. We really didn’t know if we were going in the correct direction or not but we continued to trust our GPS. Reflecting on our trip I cannot imagine why I didn’t think of the atlas that we carry for times like this! We continued up the road and saw a sign for The Little Campground and yes, it is little – four sites! We didn’t see an office but I saw some other people walking around their trailer so we pulled in and I asked them about registration. They had just gotten there and pulled into site 2 but didn’t have any information. There was a phone number on the sign so I called that number and talked with the owner. She told me that Site 2 was reserved for us but we could decide if we wanted 1 or 2. Site 2 is more shaded but since they were already parked we elected to take Site 1. We unhooked the car and Jerry backed in. We are parked right beside a bubbling brook and it sounds wonderful. I so hope we can sleep with the windows open tonight so we can listen to it as we fall asleep. After setting up we had lunch and by then the owner had come by to take our registration information. The cost is $35 a night with full hook-ups and free cable and wonderful Wi-Fi. We spent the afternoon sitting outside reading and relaxing. I think the drive took a lot out of Jerry! In the late afternoon we took a little ride, found a grocery store and stocked up on a few items. The scenery is already so pretty here and we’re just before the peaking of the flowers. 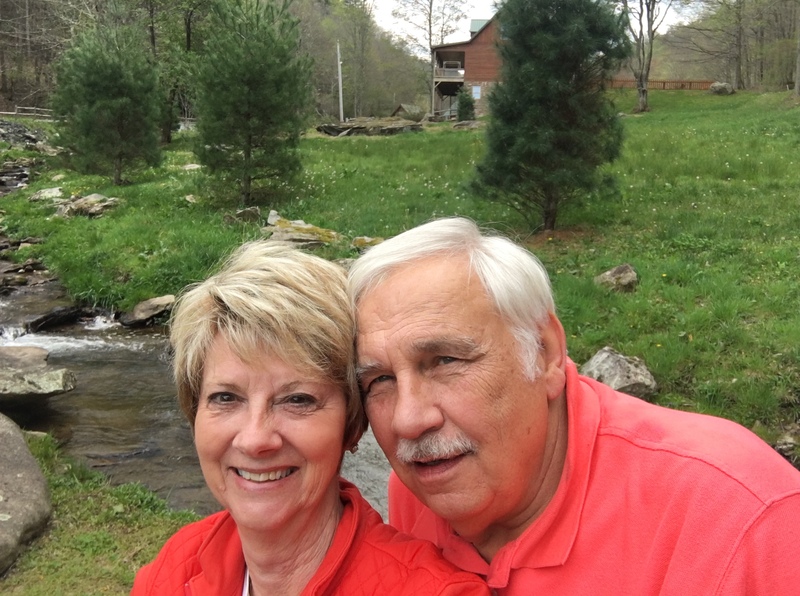 We enjoyed all of the pretty flowers at home on the coast and now we’re getting to enjoy the greening here in the North Carolina mountains. Can you see the stream? After dinner we went outside and visited with our neighbors for a while. They are from Pennsylvania and are in the area visiting colleges. They had a campfire going in their fire pit. That is something that we have wanted to do for some time and tonight we finally have a fire pit but it is so close to the back of the coach that I’m afraid to use it. Oh well, we borrowed the ambience of theirs!